Just before sunrise, when the water is calm in the Sea of Cortez and dolphins often slowly travel by, you can find Ben Sawicki on the bow of the MV Farley Mowat. The quietest section of deck, the bow is a peaceful place to begin the day with the Sea Shepherd Conservation Society. 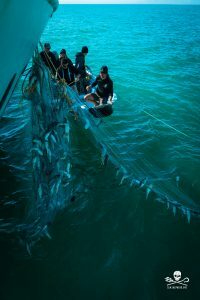 A biologist and 2015 graduate of the Master of Science in Conservation Medicine (MCM) program, Ben joined Sea Shepherd on their mission in 2016. 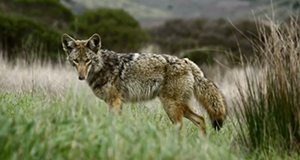 He helps the organization find and confiscate illegal fishing gear, track poachers, and document the information for the Mexican Navy through another recent passion—flying unmanned aerial vehicles (UAVs). Discover what life is like on the Farley Mowat, what drives Ben to continue his efforts toward ocean conservation, and his favorite aspects of the MCM program, below. I started as a volunteer for Sea Shepherd in early 2016 as part of Operation Milagro II on the RV Martin Sheen. Since then I have returned twice, learning and growing with each experience. My strong desire for hands-on ocean conservation and recent interest in using unmanned aerial vehicles (UAVs) for conservation efforts has led to the opportunity to fly UAVs for Operation Milagro III. 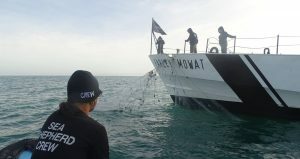 Ben (front) and the Farley Mowat crew pull illegal fishing nets out of the water. I had a wonderful time at the Cummings School! The depth and variety of experience of the instructors constantly amazed me, and the resources were excellent. What is the most important thing you learned during your time in the MCM program? We gained a level of confidence in the MCM program—whether addressing a group of people, researching specific topics we were inexperienced in, or designing new projects—these skills have helped me since I graduated and will no doubt help me in the future. What is your favorite memory from the MCM program? There are so many good memories to choose from! 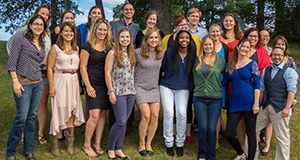 With a heavy workload, and constantly studying intrinsically intense health and conservation topics, some of the lighter, goofier times of the program were those that made the experience memorable. One of my favorite specific memories from the program was a face-to-face encounter with a captive white rhino; feeling and touching that animal’s skin and horns (knowing they are slaughtered for these parts), and looking into its eyes had a profound effect on me. Since I love what I am doing, I make sacrifices to be able to do this work. Those sacrifices, along with good timing and some patience, has led me to be a successful crew member on Sea Shepherd vessels. 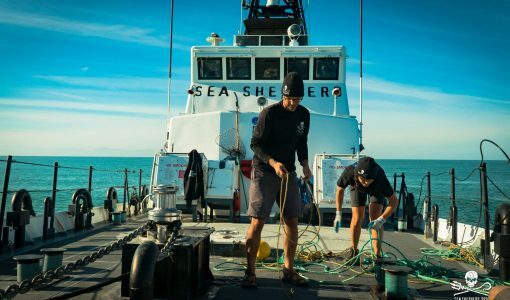 As part of the Sea Shepherd crew, Ben helps find and confiscate illegal fishing gear. Where has your position taken you? Do you have a favorite place? Operation Milagro III, our current operation, is taking place in the northern Sea of Cortez. It is a beautiful place, with a peculiar energy, which seems augmented by our activities there. In any given day, we might find live or dead sea turtles, sharks, endangered fish, dolphins, porpoises, or whales—never knowing what is below the surface always keeps it interesting. As Operation II wrapped up last year, we transited from San Felipe, Mexico to San Diego. That trip brought us up and down both coasts of Baja California and it was a gorgeous (and rocky) trip! What is the biggest challenge you face “on the job” and what helps you work through it? The biggest challenge of working on a ship, for me, is the lack of routine and personal space. I share a room with eight other people, sleep on the top of a three-tiered bunk bed, and fit all my personal belongings into the size of a high school locker. We all share one bathroom, and have security and anchor watches throughout the night. In addition, I am on call to fly night UAV missions when we suspect boats of illegal operation. The things that are important to keep in mind are the reasons we are all a part of this operation. We are here to stop illegal fishing activities, and to protect the habitat of the most endangered marine mammal in the world, the vaquita porpoise. With these things in mind, the daily challenges of living on a ship become insignificant. What has been your most rewarding “on the job” experience? Many aspects of working on a Sea Shepherd vessel are rewarding, but those moments when we find live animals in illegal nets and get to release them—those are the moments you know why you are here.